weeks ago guards stopped him from taking pictures outside the mausoleum and forced him to delete the images. 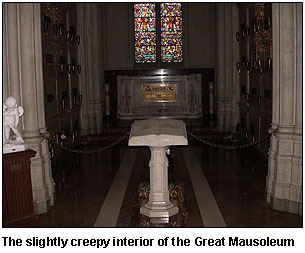 “They are not kidding,” he said, predicting fans would have trouble finding and documenting Mr. Jackson’s crypt. “If they wanted to restrict access and keep people out, they could not have picked a better place,” he said. Actually, that’s not the half of it. My father’s parents are buried in the Great Mausoleum — granddad was apparently great friends with Forest Lawn founder Hubert Eaton — so a few years ago I trekked up there to take a look at their crypt. The folks in the front office looked up the location for me after I demonstrated that I was indeed named Drum and therefore likely to be a genuine relative of the deceased, and off I went. But lemme tell you: the place is a maze. I found the right location and took a few pictures, and then spent the better part of an hour trying to find my way out. I was afraid I’d end up spending the night there. Plus the whole place is sort of creepy. Not a good place to get lost. So even if you’re a Jacko fan, I recommend you skip the whole crypt worship thing. The guards will hassle you if you’re not on their approved list, and even if you do manage to finagle your way in, you might never get out. You have been warned.